The international real-estate association FIABCI - the International Federation of Real-Estate Market Members - is hosting its annual congress in Russia this year for the first time. The congress, which will run from Sept. 30 to Oct. 2 in St. Petersburg, will showcase the city's investment opportunities to international developers and investors and will signify to investors that St. Petersburg is increasingly being recognized as an important player in the European pro-perty market. Finance and investment issues in Eastern Europe and Russia will be the main theme of this year's congress. The congress' first session will address the theme of investment security in Europe. It will look at legislative reforms, transaction safety, professional standards, corporate governance and business ethics. Russia's investment climate, the consequence of recent legislative reforms and Russian labor laws will also be discussed. Four years ago, FIABCI awarded the innovatively designed Atrium building on Nevsky prospekt first prize for excellence in its office and industrial-buildings category. 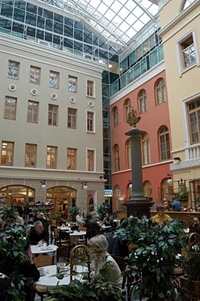 The Atrium, also known as Nevsky 25, was the first Russian building to receive this level of recognition. The Atrium opened for business at the end of 1997 after a three-year reconstruction, which cost around $30 million. FIABCI chooses its prize-winners on the basis of architectural innovation, harmony and integration with the building's existing surroundings, ecological safety and the financial success of the development. The FIABCI prize for Nevsky 25 was a positive signal for international real-estate investment in Russia, just as this year's conference is a sign that the city has truly become a player in the international real-estate investment market. FIABCI has been an association for more than 50 years. It has members in 70 countries and its research and advice is often sought by international bodies including the UN, the EU and NAFTA. While the FIABCI conference is being held, the city's Guild of Real-Estate Professionals and Developers will run its second annual conference, which will focus on managing, investing and developing commercial real estate in the city.